Study forecasts 80-90% decline in glacier cover in Albertan Rockies by 2100: implications for municipalities, agriculture, and industry. New research predicts that 80-90% of the glacier ice on the eastern slopes of the Canadian Rockies will be gone by the end of the century. 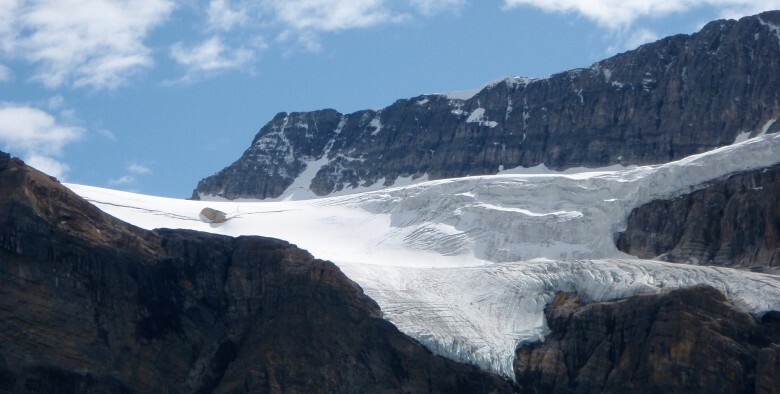 The scientists used satellite imagery, field studies, and glacier and climate models to forecast glacier change and how these changes will affect water resources in Alberta. Alberta is significantly drier than neighboring British Columbia, which magnifies the importance of melting snow and ice as a late-summer source of water for end users such as cities, agriculture, and the oil sands petroleum industry. This 80-90% loss of glacier ice equates to a decline from 1.1 to 0.1 cubic kilometers of freshwater per year into Albertan rivers (equal to 1.1 – 0.1 billion pickup trucks worth of water). The authors also found that because these rapidly receding glaciers are still responding to climate change from the last century, they would continue to lose 40% of their current ice even if the climate remained similar to today. Color version of figure 7 within the original paper: Ice volume forecasts for (a) all basins on the eastern slopes of the Rockies and (b) individual basins. (a) The upper blue lines assume that 21st century climate is fixed at the current climate. The lower red lines are that of the Intergovernmental Panel on Climate Change A1b climate scenario (link below). (b) Projections for ice volume in each basin for the A1b scenario. See the peer-reviewed paper (link below) for more discussion. Average loss of glacier ice from 2000 to 2007 has been 0.63 cubic kilometers per year, or 0.63 billion pickup trucks worth of water. The bulk of this annual release from glaciers into Albertan rivers occurs in late summer (July to September), when seasonal snow has already melted and contributed to river flows. Depending on the size of the watershed and the amount of glacier ice within it, this annual loss equals a contribution of 0.2 to 3.7% of annual river flows, or from 0.8 to 7.4% of late-summer flows. While this may sound unimportant, the margin for error in water usage in some of the fully-allocated watersheds in southern Alberta is too slim to neglect a loss of up to a handful of percentage points of late-summer flow. A color version of figure 9 within the original paper: Forecast of 21st century glacier runoff from (a) all of the eastern slopes of the Rockies and (b) for individual basins (A1b climate scenario). A key uncertainty of this study, and with glacier studies worldwide, is that glacier volumes are difficult to determine. Field surveys of individual glaciers can determine their volume, but it is not possible to do detailed field surveys on hundreds of individual glaciers such as those of the Canadian Rockies. However, the authors show that the fate of Albertan glaciers is the same under different assumptions for the starting volumes of the glaciers; climate holds the trump card here. Differences in initial volume will, however, change the total amount of freshwater contributed to Albertan rivers from glacier melt. The authors stress that their prediction is a first-order estimate and that more sophisticated approaches to predict the rates of glacier decline are needed. An intriguing unknown is how glaciers act to both catch and retain annual snowfall on the mountains, increasing annual snowpack, and withholding it into the dry summer months. This study provides one of the first forecasts of declining freshwater resources due to loss of glaciers, but the additional impact when we also lose our glaciers’ ability to catch and preserve annual snowfall is unknown. Marshall, S. J., White, E. C., Demuth, M. N., Bolch, T., Wheate, R., Menounos, B., Beedle, M. J., and Shea, J. M., 2011, Glacier water resources on the eastern slopes of the Canadian Rocky Mountains, Canadian Water Resources Journal, 36, 109-134. Bolch, T., Menounos, B., and Wheate, R., 2010, Landsat-based inventory of glaciers in western Canada, 1985-2005, Remote Sensing of Environment, 114, 127-137.